The other week I visited Drink Shop & Do. It is a Vintage styled quirky craft cafe/shop incredibly near Kings Cross station. 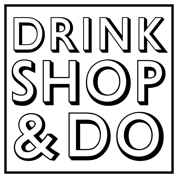 Drink Shop & Do has a relaxed vibe and a wonderfully friendly atmosphere which you don't except from its central location. Some tables were reserved for groups but there was plenty of space to just turn up even on a Saturday afternoon. It would be a perfect place for a girly hen party or birthday celebration as the themed decor makes it feel special and unlike other 'high tea' type venues. Drinks are served in an odd assortment of vintage crockery and there is a gorgeous selection of tempting cakes on offer. Even though a lot of care has gone into the appearance of Drink Shop & Do is not feel too over the top or try-hard. To add to the cafe element of the venture they also focus on making things and they run a fab selection of crafty/vintage inspired workshops like crochet, cup cake making and even a session on 'pin -up' hair and makeup.